There is a lot of hype surrounding this book series and I will admit that I really do like the series as a whole however if I pick out the books one by one I would have to day that as the series progresses the books get better. Starting off with shatter me we are introduced to Juliette who is locked away and is shown as slowly going insane. Mafi’s writing is very poetic which is why some may dislike it. It is not written as a poem but the short sentences and the crossing out along with other aspects make it a very unique style of writing. I will admit that at first I found it quite annoying but I soon got into it and enjoyed it. Going back to Juliette who, herself throughout the book is very stubborn and whiny (think Bella Swan and America Singer mix). Throughout the entire book she is trying to convince us (the readers) that she is not a monster or crazy… Just different. Warner and Adam are the other town main characters in the book and I will be honest and say that I didn’t care much for either of them, however my opinion changed after reading Unravel Me. All in all, Shatter me was a decent dirt book as the character introduction was great, and so was the world building however I can’t say that it was action packed. Lots of people really don’t like the first book because they seem to think that it is simply a 338 page introduction. Read it! Then move on and enjoy the other two amazing books! As mentioned above I really did like Mafi’s writing style and it just got better in this book because the character development is amazing as throughout the book you see Juliette slowly stop doubting herself and understanding her true potential (awesome power) and how to use it for good. New characters are introduced such as Kenji ( fangirl moment!) who becomes Juliette’s best friend and is the one that puts an end to her self pity parade. It’s refreshing to have a guy that’s a main character but not part of a love triangle or any form of romantic involvement! Juliette once again was moody and annoying but towards the end of the book you could see her character develop into a stronger person both mentally and ability wise (powers). The love triangle… Team Warner all the way! Adam is so moody and rude, he wanted Juliette to stay helpless and weak so that he could always be there to take care of her, but that was selfish and I’m glad she gave him the whole “It’s not you, it’s me speech”. OMG CHAPTER 62 was just…. Hot. Warner and Juliette have the most amazing chemistry and no matter what anyone says it is undeniable. An absolutely brilliant conclusion to the trilogy! The character development was excellent and it was nicely finished for all of the main characters ( Juliette,Adam, Warner and Kenji). The book was absolutely hilarious even though there were some moments that made you want to cry. Kenji was great at lightening the mood throughout the book with his snarky and sarcastic remarks. He was an awesome friend to everyone, especially Juliette who finally stopped doubting herself and therefore there were no more cross outs! Juliette’s character developed so much throughout the series, and she had an amazing ending. Throughout the transformation I was finally able to connect with her and stop wanting to kill her myself… Same was with Warner who got over his self-Pity and fears. This book was so action packed and was so difficult to put down due to the short chapters I read it in one sitting without even realising it. I have a place in my heart for each and every one of the characters (Adam…not really). It ended nicely but with room left for a continuation… Go read this trilogy!!! 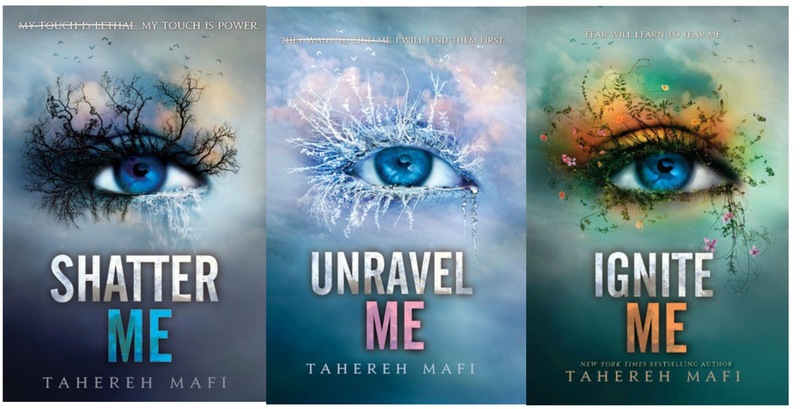 Tahereh Mafi’s character development is incredible! She is working on a new novel now, which I am so excited for! I know it’s coming out this summer!